The abnormal expression of different classes of molecules is known to be linked to various types of cells becoming cancerous. This is also true for the recently discovered group of small, noncoding molecules called microRNAs (miRNAs), although much remains to be investigated about how they can prevent or induce tumors. A new study reported in the journal Blood Advances extends knowledge of the link between miRNAs and cancer by showing that the absence of miR-146b and miR-146a in mice led them to develop blood cancers such as leukemia and lymphoma. However, the researchers also identified differences in features of the cancer cells themselves, depending on which miRNA was absent, along with variation in which type of cancer developed and at what rate. The Tokyo Medical and Dental University (TMDU)-based team used a genome editing technique to knock out the gene encoding either miR-146a or miR-146b, and then subjected the mice to a number of analyses to reveal the effects. "After the mice had been established, we determined the rate at which they developed tumors, analyzed and characterized their tumor tissue at the cellular and molecular levels, and also focused on key features of their immune cells, specifically their B cells," says Hiroshi Asahara of TMDU's Department of Systems BioMedicine. "This allowed us to see if the effects of lacking miR-146a differed from those for miR-146b, and also to compare these mice to those without any knockout at all. We could also detect any similarities in their cancers to those that develop in humans." The results showed that both miR-146a and miR-146b suppress the expression of a range of molecules that in turn prevent the activation of a protein complex called NF-κB. If either of these miRNAs is knocked out, NF-κB is overactivated, which leads to excessive progression of the cell cycle and rapid cell duplication, generating inflammation and tumorigenesis. 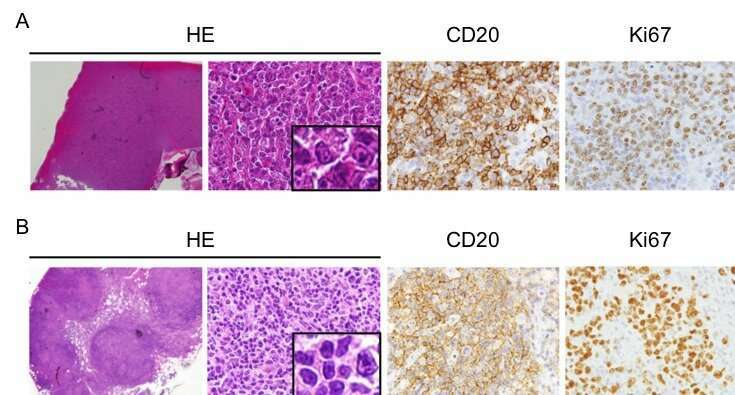 In the mice, this manifested as high rates of B-cell lymphoma and acute myeloid leukemia. "Although there were many similarities in what happened to the mice when we removed miR-146a or miR-146b, which is unsurprising given their identical seed sequences and mRNA targets, we also found some differences," says lead author Takahiro Mitsumura. "For example, mice lacking miR-146b developed malignancy less than those without miR-146a. There were also differences in histological features within the cells in B-cell lymphomas, including regarding positivity for various tumor markers." The team hopes that this work will contribute to efforts to combat diseases involving miR-146a and miR-146b dysregulation, given that this has been identified in a number of human cancer types.